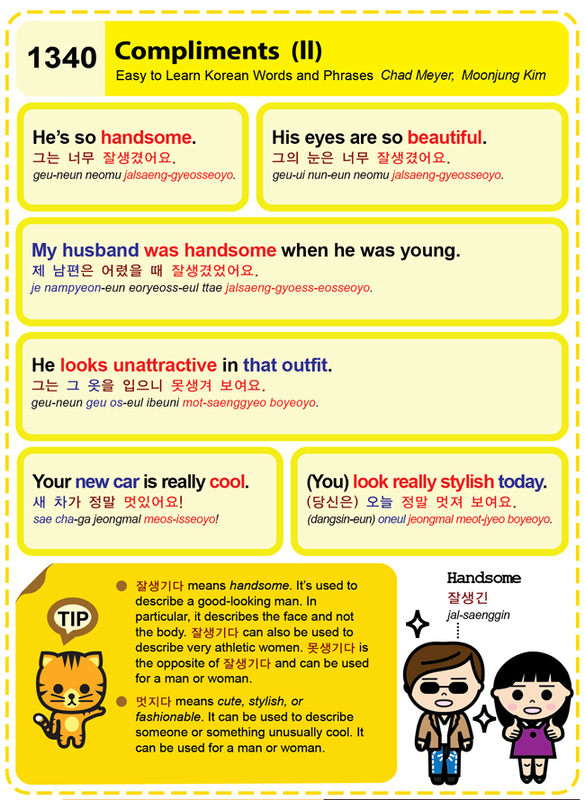 Easy to Learn Korean 1340 – Compliments (part two). Posted in Series	| Tagged (You) look really stylish today., (당신은) 오늘 정말 멋져 보여요., compliments, cute, good looking ma, handsome, He looks unattractive in that outfit., He’s so handsome., His eyes are so beautiful., man, My husband was handsome when he was young., or fashionable, someone or something unusually cool, stylish, very athletic women, woman, Your new car is really cool., 그는 그 옷을 입으니 못생겨 보여요., 그는 너무 잘생겼어요., 그의 눈은 너무 잘생겼어요., 멋지다, 못생기다, 새 차가 정말 멋있어요!, 잘생기다, 잘생긴, 제 남편은 어렸을 때 남편은 잘생겼었어요.제 남편은 어렸을 때 남편은 잘생겼었어요. Easy to Learn Korean 935 – (Expressions) – Killer Technique. Easy to Learn Korean 224, 682 – Gwiyomi lyrics, 1+1 Gwiyomi Player, and Acting Cute. Since earlier this year, the 1+1 Gwiyomi Player game and Gwiyomi chant have gained popularity across the internet. If you do a YouTube search, you’ll see many singers and actresses performing this song-game. Korean girls play this in order to woo men who love the cute factor- and all Korean men LOVE it. This game is also known as Aegyo Gwiyomi or Cutie Player.